Started work on spell requirements. Each spell has requirements and if they aren’t met, the spell is not playable. 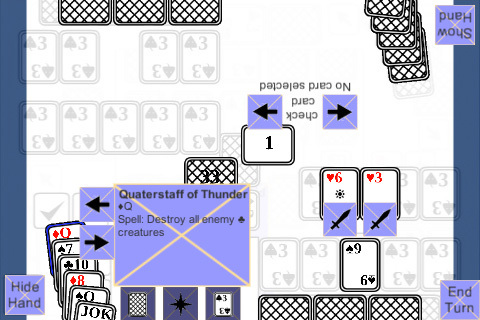 In the screenshot the card highlighted has the effect of destroying all of a certain type of the opponent’s creatures. Since they have no creatures at the moment, the middle play spell card button is disabled. What’s next: add spell requirements to the rest of the spells.